At least 13 people were injured as a Chattogram- bound train hit a picnic bus carrying students and guardians of a madrasha on a level crossing near the Eco -Park in Sitakundu upazila on Wednesday, reports UNB. Eleven of the injured were identified as Daud, 45, Shirin Aktar Kamal, 45, Masuda Begum, 44, Muzahid, 10, Farzana Aktar Munni, 15, Abul Hashem, 16, Sayed Hasan, 15, Abdul Awal, 14, Faisal Ahmed, 12, Imon, 11, and Moin Uddin, 11. 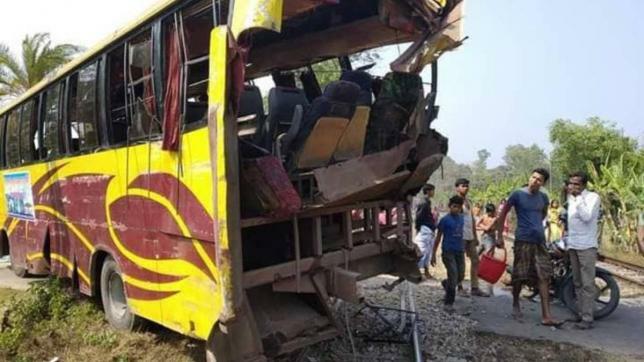 Deputy assistant director Md Jashim Uddin of Fire Service and Civil Defence said the picnic bus carrying students and guardians of Darul Arqam Madrasha got stuck on the rail track as the gatemen lowered the bar around 2:00pm. A Chattogram- bound train rammed the bus and damaged a portion of the vehicle, leaving 13 people injured..
Two teams of fire service from Kumira and Sitakundu rushed to the spot and rescued the injured. The injured were sent to Sitakundu Upazila Health Complex. Among them, three were sent to Chattogram Medical College and Hospital as their condition deteriorated.